I reckon this was probably the first or second Bond film I saw, and I think that Pierce Brosnan is one of my favourite Bonds. Him and Sean Connery. Daniel Craig’s pretty rocking as well. I could go on like this for a while bunch more names and probably end up naming all of the Bond actors, but perhaps I should get back to the film. 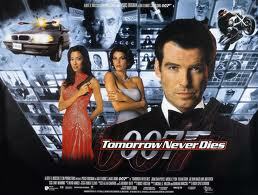 This is an excellent Bond film – running, shoot, parachuting, scuba outfits, raunchy moments with beautiful women, car chases. All of that. How marvellous. See, a British boat has been sunk, supposedly in Chinese waters. When Bond goes to investigate, he discovers that a missile has been stolen, and sets out to find out by whom and how. Along the way, he meets a couple of beautiful women, one of them ends up not so much alive and he needs to avenge her death which conveniently also allows him to wrap up all the other stuff.